Susana Osinaga Robles is the nurse who washed Che’s corpse. She’s a small woman of seventy-four with wavy hair and swollen legs. Her story begins on October 9, 1967, in Vallegrande, a town lost in the far reaches of eastern Bolivia. Those were the days when the Cold War pitted Communist countries against their capitalist rivals. Ernesto “Che” Guevara, the ambassador of armed struggle, arrived in South America determined to make the continent yet another set on the stage of world revolution. 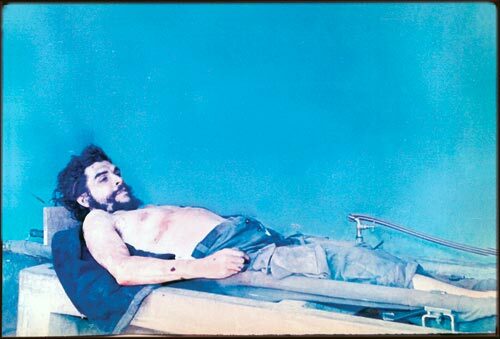 But after his defeat at the hands of the Bolivian authorities, his well-washed body was displayed like a battle trophy. Four decades later, in her living room, Nurse Osinaga wishes to be paid for talking about what she saw, heard, and washed: fifty bolivianos, she says, lowering her voice to a near whistle. It’s a fixed fee that equates to about six dollars or the price of just about any cheap souvenir at any tourist destination worldwide. 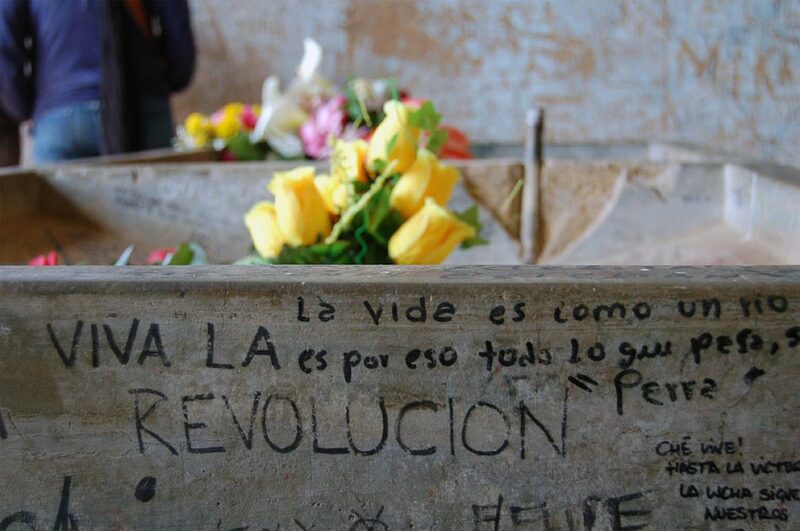 And the residents of Vallegrande are determined to exploit their distinction as the town where Che’s remains were buried. Thus, for the nurse who washed his illustrious corpse, the public recitation of her story has become a trade like any other. Osinaga worked at the Hospital Señor de Malta until her retirement in the late eighties. Now, surrounded by grandchildren, she minds a grocery store in the center of Vallegrande. In her shop the merchandise is stacked on shelves in no particular order. Today, a morning in early October, she’s mounted a sales display of calendars bearing the guerrilla leader’s image. She hopes pilgrims and tourists on the so-called Ruta del Che will come to hear her as they always do on the anniversary of Guevara’s death. Che’s Route is a tourist destination promoted by the leftist government of President Evo Morales. But despite the publicity, infrastructure to accommodate visitors along its eight hundred kilometers (from Camiri in the south of the country to Vallegrande in the north) is nearly nonexistent. The road trip from La Paz remains a twelve-hour journey of twists and turns. According to the town’s tourist office, travelers still arrive only in fits and starts. That Vallegrande’s mayor belongs to a right-wing party is just one sign that Che’s revolutionary message never took root with the town’s nearly twenty thousand residents (and few remember anymore that it was a peasant who handed Che over to the army). Nor does his image inspire great devotion among most residents. They seem to care mainly about the lands they till; they stroll aimlessly along streets lined with squat buildings and leave the doors of their houses open, hoping to catch a breath of fresh air. However, some people are aware that Che is a high-value tourist attraction. “I washed him,” they tell visitors. “I had a few words with him.” “I clipped a swatch of his hair.” All these memories are for sale. There are those who sell cans of earth from the site where Che was buried until 1997, when his gravesite was found. “With his blood,” hawkers of the dirt affirm. A gallery conspicuously located on the central plaza offers ceramic likenesses and huge portraits of Che in silhouette. Each piece costs four hundred dollars. An establishment nearby features documents, posters, pins, photos, and photocopied books about Che. A truck parked next to a market is loaded to capacity with El Che rum. In the ad on its side panel a bikini-clad model holds a bottle of the liquor on her lap with Che’s face on the label. No images of Che hang on the walls of Susana Osinaga’s store, but the calendars with his picture sell like hotcakes. Before I can talk to her, her son, a man of forty with a thick beard, waves a notebook at me with various foreign surnames inside. Then he demands to know my name and tells me to follow him to his mother’s store where Osinaga drinks coffee at a wooden table. She catches sight of me out of the corner of her eye and disappears through a door at the rear without speaking. The son then directs me to a small sala with nondescript blue walls where Osinaga has settled herself in one of the room’s three chairs like a doctor about to see a patient. A Che poster hangs above her. “What do you want to know?” she asks in a rasping voice. And this must be the way she’s been addressing her listeners since the late eighties, when she first got into the business of sharing her memories. Osinaga was thirty-four when an army officer came to ask her to clean the corpse of Che Guevara. “We didn’t know who he was,” she says as if repeating a school lesson from memory. “We took off all his clothes. He was wearing boots that went halfway up his calves, two pairs of pants, and three pairs of socks. I was struck by his eyes. They seemed to stare at us.” Osinaga’s son watches his mother slip into something like a trance state. “We put pajamas on him, but the soldiers pulled them down to show where the bullets were—in a rib, in his leg, his heart. He had bled dry.” Almost everyone in town came to see, thousands of people. Then Che, who in life would have been a stranger to most residents of Vallegrande, in death became the center of attention. These days people in the town organize masses in his memory and even pray to him, Osinaga says and hastens to add that Che hasn’t performed any miracles for her. “But I’m just about to ask him for one, and soon I’ll be able to tell you about it,” she exclaims with a touch of irony, then gets to her feet, putting an end to the interview. “That’s fifty bolivianos,” she says before leaving. “As you well know, if you’re sick, you can’t make ends meet on retirement benefits.” The son writes my name in his notebook, the one with data on other journalists and visitors who listened to the same story. He does so with the cold indifference of any routine business transaction. Che has taken over the country. It’s October 2007, and there are observances of the fortieth anniversary of his death—roundtables, book shows, concerts, speeches—all over Bolivia. In the towns of Vallegrande and La Higuera rooming houses have hung out NO VACANCY signs. Pilgrims—barely a thousand of an expected ten thousand—take shelter in small tents. There are Uruguayans, Argentines, Brazilians, and, in smaller numbers, Europeans and North Americans. Most belong to Communist parties or less radical organizations. Many arrived in vans or on private buses and are identifiable by outfits that include revolutionary slogans, red shirts, berets. They get the usual tour. First the laundry where the guerrilla leader’s body was put on public display, then the mausoleum on the site where his remains were found in 1997. With the hint of an evening breeze in the air, the townspeople watch the procession. The house of Julia Cortez is on the way to the tomb, six or seven blocks from the main plaza. Cortez is a retired teacher who was asked to prepare coffee for Che while he was still a prisoner in the nearby town of La Higuera. According to Jaime Niño Guzmán, the officer who transported Che to Vallegrande by helicopter, he had a thick beard at the time, and he smelled bad. “I think he was desperate to die,” Niño Guzmán told me, when he spoke with me in La Paz. “He assured me that he’d be more valuable dead than alive.” Teacher Julia Cortez was witness to these moments. A neighbor says she customarily charges foreign journalists between a hundred and three hundred dollars to recall a story she must have repeated hundreds of times. “She charges tourists and Bolivian journalists less,” said Zacarías García, a Spanish photographer who visited her recently. For them the fee fluctuates between fifteen and a hundred dollars. (I wonder, Did she also charge the condemned Che for his cup of coffee?) A figure looks furtively out from behind the metal door of the Cortez house. It’s a two-story, cream-colored structure. “What do you want?” she asks in a near whisper. She’s barely five feet tall. She wears a food-stained apron; her hair is curled and oily. She looks me up and down and brings her face so close to me that I can even discern the fine hairs that make up her faint mustache. “Come back later,” she announces at last. I never again find her at home. Those who have succeeded in talking to her—like the Spanish photographer—say that Cortez was a nineteen-year-old rural schoolteacher in La Higuera, the town where Che was apprehended. She’d have been one of the few people who dealt with him at any length in the short time he was there and still alive. That’s what they say, and now that brush with the guerrilla hero seems to have endowed Cortez with a certain haughtiness. She decides when and with whom to share her memories. In the plaza at Vallegrande there’s an austere museum where a few photos and some print material related to Che are the only treasures on display. To learn more about him you must look beyond this exhibit. Nearby is a hardware store named after the town. It’s a family business with a large counter, dim lighting, and shelves filled with nuts, cables, screws, locks, and gears. The daughter of René Cadima, the photographer who took several snapshots of Che’s corpse, runs the place. Cadima himself is close to ninety now and takes afternoon naps. In the evening, I find him drinking hot tea with crackers. He has abundant white hair and big glasses that have worn furrows across his face. His legs were amputated due to diabetes, and he now gets around in a wheelchair. He’s blind and can barely hear. A school-age grandson approaches him with a tape recorder, and, as if by conditioned reflex, old Cadima starts to speak nonstop. One of Cadima’s photographs of Che. Cadima continues his tale. “Two or three days later, the body disappeared. There was lots of talk: what if it was buried in the jungle, if it was burned; some even said that his remains were found near the airport, in 1997. People complained because his bones were allowed to be taken to Cuba.” Now Cadima grasps one of his photos. Che is lying on a stretcher placed on top of a washtub in the laundry, and a disfigured guerrilla fighter is lying on the floor. Cadima is proud to show off his handiwork, as if his own life had halted at that moment. When the interview has ended and I’m about to get up, Cadima pulls at my forearm. “I’m always favored with a few small bills,” he says. I offer to buy two copies of his photos instead. Five dollars. The old man has me give them to his daughter, who is stationed behind the counter in the hardware store. Then his grandson rolls him away in his wheelchair. 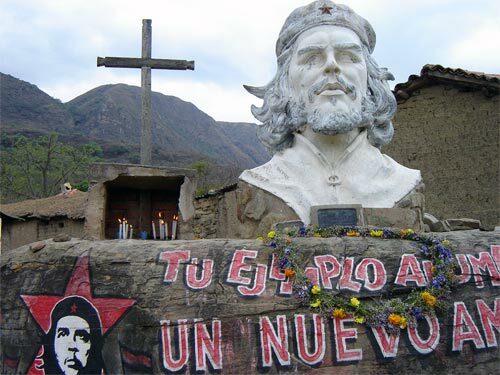 La Higuera is one of the most important stations on the tourist trail tracing the passion of El Che. Guevara was captured in the semi-jungle surrounding the town on October 8, 1967, which is also the place where his comrades were massacred. La Higuera is little more than a hamlet of some twenty houses, and almost everyone who lives there was alive in the time of the guerrillas. Today the town’s one street, which is wide and rather long, is full of people attracted by the anniversary. The rest of the year it’s empty, and tourism becomes less an activity than an event that people wait for, like Christmas. Next to the road is the telegraph office where a contingent of soldiers that had been pursuing Che and his fellow rebels for months received the coded message to kill him—Tell Father good-morning. The order had come from the Palace of Government in La Paz. Now the place is an environmental shelter. There’s no electricity in La Higuera, despite the government’s annual promise that there will be by next year. 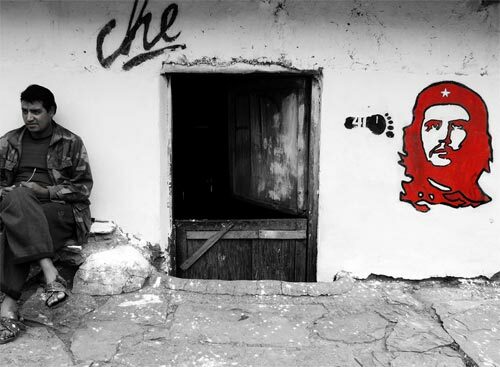 Many of the houses have pictures of Che on their walls, and the school where he was held has been turned into a makeshift museum with a few books and a handful of photographs testifying to guerrilla actions in the area. On the way to the plaza is a private house with a metal door and a blue cardboard poster stuck to one of its adobe walls. It says: CHE HISTORIC MUSEUM. A neighbor says that inside is a chair that Guevara sat on. Nobody’s home today. Tomorrow the poster will be gone. The people who live here only post the sign when there are at least a hundred outsiders in town. Other inscriptions are scattered across the bare adobe of neighboring houses. REMEMBER. THE REVOLUTION IS EVERYTHING, AND NONE OF US IS WORTH ANYTHING ALONE. YOUR EXAMPLE LIGHTS UP THE NEW DAWN. Next to this last message is a store called La Estrella. It’s run by Irma Serrano, who met Che during a street festival. She saw him again after his arrest and brought him his last meals before he was killed. Serrano is nearing seventy and was in her twenties when she looked after Che. There’s not much to buy in her store. She has beer, Astoria cigarettes, rice, cooking oil, and a few canned goods. At the moment she’s sweeping up with a loosely tied bundle of twigs, and Che appears to watch over her efforts from a colored poster on the wall. “He was quite good looking,” Serrano says. “He had a lovely expression on his face.” She goes on to recall September 24, 1967 (just days before he died). Che and his followers came to the Festival of Our Lady of Mercy. They danced, drank corn liquor, carried on conversations. They also bought a pig, paid for with bolivianos and dollars at a time when greenbacks were rare in this part of the country. Serrano says they invited everyone to partake, then adds, “We were afraid of them. We weren’t used to men with beards. We didn’t even know who he was until years later.” For residents of this hamlet he seemed more like a strange foreigner than a savior of the world’s poor. Irma Serrano saw Che again after he’d been taken prisoner. “On orders from the army, I took him coffee, empanadas, and eggs,” she recalls in her store. “We put them all on a chair. All he said to me was, ‘Thank you.’ He seemed very sad and down in the dumps.” Four decades later the inhabitants of La Higuera light candles to him and toast him on holidays, the old lady says. “I speak to him, and he helps me. When my husband was sick and I couldn’t afford to buy medicines, I prayed to his picture, and someone always came to help me out.” Now there are Cuban doctors at a nearby health clinic, and Serrano thinks this is also thanks to Che—and the end to his decades-long curse. In the city of Santa Cruz de la Sierra another team of Cuban doctors restored the eyesight of Mario Terán, the soldier whose superiors ordered him to shoot Guevara point-blank. Terán was one of the men beset by Che’s curse. This stigma is also said to have punished La Higuera with drought. Serrano explains it as Che’s vengeance on the town that turned him in. The curse has also delighted in bedeviling Gary Prado Salmón, the general who headed the mission to capture Guevara and ordered his execution. Prado spends his old age in a wheelchair. Honorato Rojas, the peasant who alerted authorities to the whereabouts of the guerrilla band, was murdered. René Barrientos, who was president of Bolivia at the time, burned to death in a freak helicopter crash in 1969. Juan José Torrez, the army chief of staff, was killed by paramilitaries in Buenos Aires. And intelligence chief Roberto Quintanilla was shot to death by a Bolivian guerrilla fighter while serving as consul in Germany. “But more than a curse, he’s a miracle worker,” Irma Serrano insists. “Maybe he’ll bring us electricity.” She then requests a few bolivianos in exchange for her testimony. In lieu of payment I buy a few beers from her. Writing about Che Guevara’s final days can cost a fortune. Today is October 9, the fortieth anniversary of Che’s death. La Higuera, the town where he was taken prisoner and murdered, dawns with the kind of heat that makes wounds fester. Its one street has already welcomed several groups of pilgrims. Martín Sharples is Argentine; he’s forty-one years old and is missing a leg. He’s arrived in the hamlet with the help of an orthopedic prosthesis and wants to ride eighteen hundred miles on his bicycle in a bid to raise the flags of justice and freedom that Che once held aloft. “What I want is to protest the thirty thousand disappearances that occurred during the last of the Argentine dictatorships, Videla’s,” he says in a thick gaucho accent. “What impresses me most is that the people around here say the guerrillas paid for everything they consumed. It turns out that those murderers offered the villagers their support.” In La Higuera, however, locals limit their remarks to anecdotes. They never mention the cause Che championed, nor do they talk about the guerillas who fought by his side. While I chat with Sharples, a small bus carrying Brazilian pilgrims parks nearby. Among them are three men who share an interest in religion: a liberation theologian, a Zen monk, and an Anglican pastor. They’ve come to render a private kind of homage. They collect dirt in small bags, sing, pray, link arms, get out an enormous photo of Che, and end their observance with a revolutionary slogan: “Forever onward to victory!” But there are also those who look on with distrust, annoyed by what his legacy has come to and by the manipulation of his image. “This is a circus, pure theater. People come here as if they were going to the zoo. Nobody’s ready to fight for an ideal,” Agustín Romero growls. He’s a twenty-five-year-old craftsman from Argentina who’s been in La Higuera for several weeks. He says he has no use for the show put on to commemorate the anniversary. Nonetheless, here he is in this “Socialist Holy Land” selling earrings and necklaces to finance his travels. Romero has told me how to get to the house of Manuel Cortez, a peasant who recalls his experiences with Che as if the fallen leader were still alive. Cortez is sixty-three, and he greets us respectfully while cleaning his patio. The only belongings on view are a cot, a handful of old clothes, and some books about the life of Che. “The radio said the guerrillas stole pigs and chickens, but that’s a lie,” he says. “They had glasses that could see in the distance. They came in pairs to get supplies. They paid for everything.” He goes on to recount the fighting at Abra del Batán where several guerrillas died a few days before Che was caught. “The soldiers made us help them and provide mules. Then they caught Guevara. He clung wounded and limping to the arm of a soldier. They wouldn’t let us into the school were he was held. They took lots of pictures of him, got drunk, and killed him. When I saw him he was lying in the middle of the house. He was bleeding from the chest.” He speaks slowly, as if the memory still pained him. Cortez assures us that in La Higuera everyone reveres Che; for asking his intercession one Che-sat-here spot is as good as another. He lives alone, and the pesos he garners for sharing his recollections are extra income that supplements his meager earnings from growing fruits and vegetables. On anniversaries such as today the town is full of people, and there’s no shortage of curiosity seekers and journalists wishing to hear his story. The Swedish journalist gives him eight dollars. Cortez is pleased to accept them before going off to feed his chickens. Lygia Morón Cuellar is sixty-six, but she’s not a widow. She’s one of Che’s virgins. “I have never known a man,” she confesses. A color photo of Che occupies a place of honor in her house. It reigns over a kind of flowerless altar before a photo of her sister. Morón, retired from the cooperative where she worked, belongs to the Ernesto “Che” Guevara Foundation. “When I saw him, he was already a corpse, and he was naked,” she recalls. “I covered him so the young girls wouldn’t see him.” Now hardly a day passes when Morón doesn’t pause before the image of the guerrilla leader to wish him good-day and good-night as she might a patron saint. On the way to the mausoleum where the faithful pay tribute to the remains of Guevara, I come across two women impeccably attired in long black mourning dresses and shawls. One is Alejandrina del Valle, the other is her godmother, Inés Robles, and they’re going to pray at Che’s shrine. It consists of seven very simple stone markers and a mural honoring the fallen guerrillas. “We say three prayers to Che and ask him to help us sell our corn liquor,” Alejandrina says. Her godmother, who’s making her first visit to the shrine, shuts her eyes and keeps them shut for several minutes. The tomb is symbolic. Guevara’s remains were discovered in 1997, by a team of Cuban and Argentine forensic anthropologists, and shipped to Cuba (though there are those who doubt their authenticity). What would have happened had the body remained in Vallegrande? Might its people have been freed from the past? Or might its presence have attracted more pilgrims? Who can say? As it is, Vallegrande is a town in limbo, a ghost town brought to life each year when Che Guevara, its most illustrious spirit, dies once again on the ninth of October. Álex Ayala Ugarte is the nonfiction editor of the Bolivian weekly Pulso. His work has appeared in Gatopardo (Mexico), Perfil (Argentina), and Paula (Chile). His contribution to this issue originally appeared in Spanish in Etiqueta Negra (Peru).